I compared these results to where Google says IndieCommerce traffic comes from and found some interesting differences. According to Google Analytics, Google search is indeed the #1 source of Web traffic to most stores. 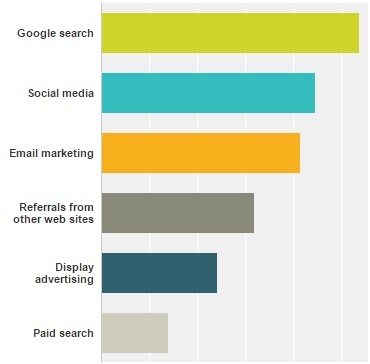 Referrals #2, Social media is #3, Email marketing #4, Paid search #5 and Display advertising #6. Over the next few weeks we'll discuss different techniques for increasing traffic and sales through each of these channels. Webinars will now be held on Tuesdays from 2:00 p.m. to 3:00 p.m., Eastern Time, and will be repeated on Thursdays from 11:00 a.m. to noon, Eastern Time. We will now be rotating specific topics with open Q & A webinars. For example, one week we will focus on order fulfillment in both the Tuesday and Thursday training, and the next week we will conduct an open Q & A. This will give you time to take in what we discussed, to refer to the webinar recording and documents, and to come back with questions. Of course, stores are welcome to ask questions on any topic during these open sessions or email us at anytime. For all webinar information - dates, topics, sign-up links - please visit the IndieCommerce Webinar page on BookWeb.org. The layout of the product page depends on the theme, LSI data, and blocks added to the product page. Please confirm that the large cover image looks good on your site when enabled. ​ Tip - Removing blocks on the right navigation bar on the product pages might help. If you have any questions about this feature, please contact IndieCommerce support. We have made it easy to apply discounts / markup to books by ISBN - A Store Pricing tab has been added to the product page. This tab will take you to the Store Pricing Tool, to add or edit the store pricing entry for this ISBN.